All our plants are very realistic, yet need no water, fertilizer, or pruning. They're all shipped "bare trunk" (planters not included), and can be shipped UPS. To place an order, or if you have questions, please contact us by email or phone. These are all plastic, including the thorns. Safe to touch! These have a plastic dark green underbase, with a soft fuzzy grey coating. No thorns at all. These have a plastic dark green underbase, with a soft fuzzy grey coating. No thorns at all. These are all plastic, including the thorns. Safe to touch! These are all plastic, including the thorns. Safe to touch! Soft wired leaves, with two ears of corn. 90" (over 7') tall! 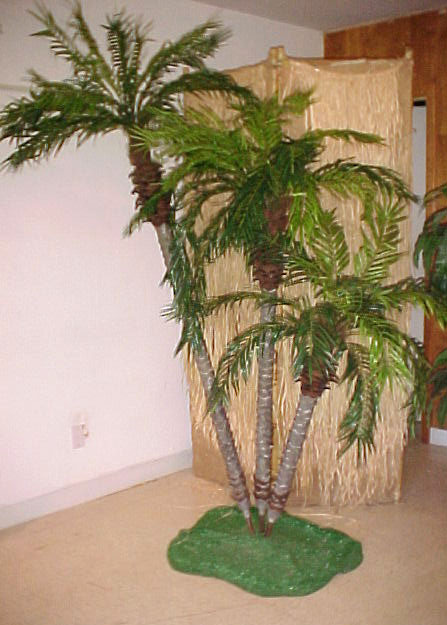 The palm trees, like the other plants, are shipped without bases or pots. We can build bases for you, or we'll be glad to tell you how we built ours. Just ask when you place your order. Click on a photo for close-up views. 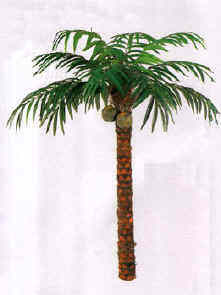 This palmtree has a natural fiber trunk and two coconuts. PPT298 trunk can be shaped for that windblown look. (PPT297 trunk is not flexible). Great for interior use, but not suitable for long-term exterior use. This palmtree has a plastic trunk. Great for interior use, but not suitable for long-term exterior use. The photo shows the ppt2512, ppt2511, and ppt2510. They are priced individually, and you can order any combination.